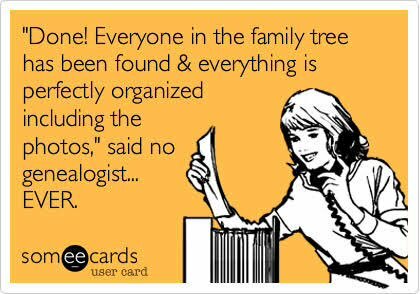 Genealogy has been my subject of interest since I was in grade four. I had made a family tree on a piece of paper with different colored markers and it was interesting how small my paper looked once the tree started expanding. I wished I would make a proper family tree one day. I’m happy to have fulfilled my own dream. Of course the effort is ongoing and it isn’t possible to ever complete this hobby. So my real family tree is online at Ancestry website but I have made a Genealogy journal so I can share my research with friends and family without having to turn on my laptop. I had shared my Ancestry Journal with you all on the blog on this link. 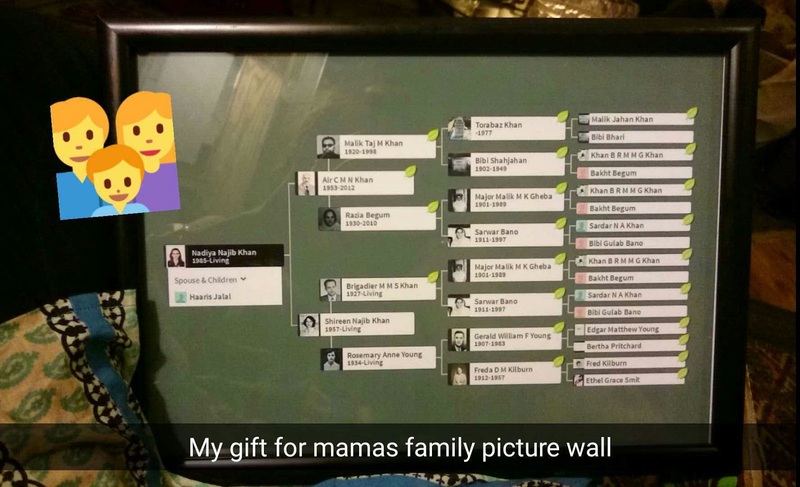 Afterwards when I was decorating my new home in Lahore, I thought theres not a single wall hanging of my hobby Genealogy where as I have many of my other hobbies displayed on the wall i.e. painting, postal stamps and key obsession. I had visions in my mind of a family tree till my great great grandparents. I only had to take out time and get down to this project. One day last month, my sister Nataliya was over and she showed me this pin on Pinterest which again inspired me to make our family tree. 1. 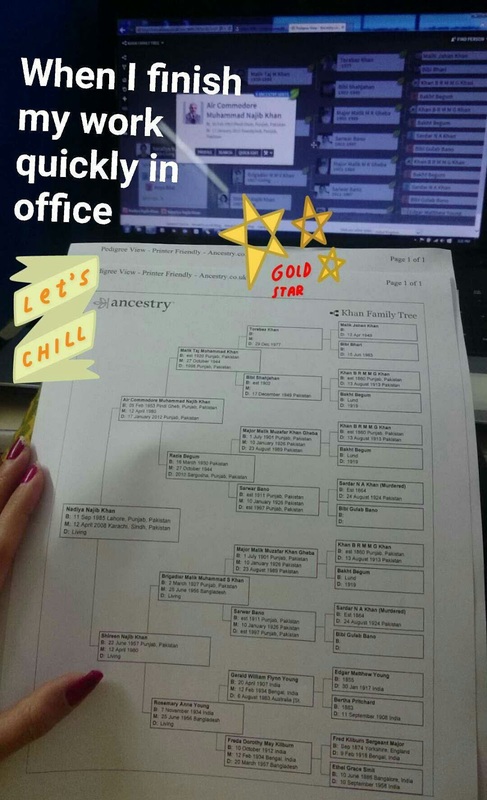 How to add so many great great grandparents on one chart paper? 2. So many of my ancestors are repeated again and again due to cousin marriages. How to avoid duplicate persons on the tree? 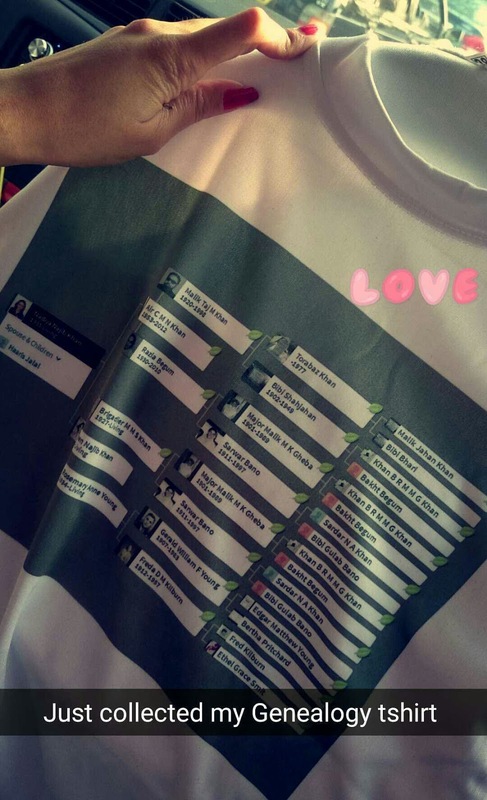 While I was in the process of getting these printed, I got an amazing idea from my colleague which was to get a t-shirt printed with my family tree on it. So there I was getting a little carried away with that thought on my budget but it was sure something that bought me happiness. That matters really! So I wore it in my home once. The first thing my husband said to me when he saw me in this was that he won’t be able to come close to me when I’m wearing that t-shirt as he doesn’t want all my ancestors to be staring at him. Now I know what to wear when I want my me-me time next. The reason I shared these ideas on my blog is to hopefully motivate you to make your family tree display. These projects gave me a lot of satisfaction and happiness as I knew I was investing my time into something useful. Inspired yet?